HyperCam is a program that facilitates taking screenshots. It is able to record everything occurring on the screen and record it as video in AVI format. It is also possible to capture sound. 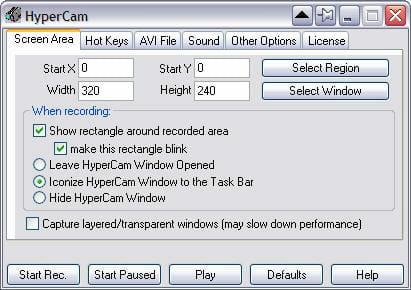 As its name suggests, HyperCam can record as a video what you see on the screen. It is possible to define a specific region to capture in order to only capture the essential. It will then be recorded in AVI format. Using shortcut key can be done to trigger a capture. Recording an audio sound can be done easily. This option is perfect for creating tutorials. Users can, plus the screen capture to video, add comment or give instructions with their voice via a microphone. In case it is necessary to add written comments on a video, HyperCam has integrated it with a text editor. The texts can be in the form of bubbles in the comic genre or other. Perfect design tutorial in video form. Easy to handle and implement. Simple and well designed GUI. Latest update on September 21, 2016 at 08:30 AM.